The City of Grafton acquired the Historic B&O Freight Station from CSX Inc. in 2017 to have a permanent home for the Grafton Farmer’s Market. Originally built in the mid 1880’s by the Baltimore and Ohio Railroad it is the oldest railroad structure remaining in Taylor County. Working with the West Virginia Department of Environmental Protection and Environmental Standards Inc. the city is in the final stages of performing all the necessary environmental work needed to ensure the public’s safety and welfare on the site. A new electric service, windows and doors, a new roof and other improvements are needed before the building can be open to the public. Grafton is located in the heart of northern West Virginia. 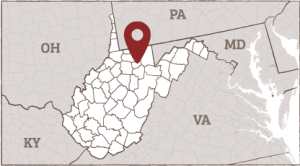 Nestled inside of Taylor County, Grafton is centrally located about 25 miles from Morgantown, WV and 23 miles from Clarksburg, WV. Email us, or follow along on social media to see what’s happening in and around Grafton. This project is a collaboration between the Grafton community and West Virginia University Reed College of Media. Funding for the project was provided by the Claude Worthington Benedum Foundation. All photos, unless otherwise noted, © WVU Reed College of Media. Stay in-the-know with all the latest updates,upcoming events & much more.